Iams claims that their food provides “nutrition that’s tailored to bring out their unique best”, but will Iams cat food bring out the best in your cat? Let’s learn more about Iams to determine whether or not it’s a healthy, high-quality choice. We’ve taken a close look at Iams and graded it according to the We’re All About Cats standard, evaluating the brand on species-appropriateness, ingredient quality, product variety, price, customer experience, and recall history. Here’s how it scored in each of these six key areas. In total, we give Iams cat food a 31 out of 60 rating or a D grade. 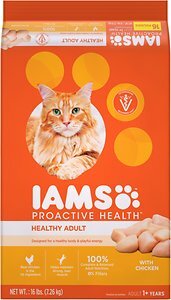 Iams is owned by Mars, Inc., with the exception of their European branch, which is owned and manufactured by Spectrum Brands. Iams was created in 1946 by Paul Iams, a self-taught animal nutritionist from Ohio. Iams originally made and sold high-protein, high-fat dog food. In 1950, Iams developed the first dry dog food made primarily from animal-based protein. The company later expanded into cat food. In 1999, the company was sold to Procter & Gamble (P&G), allowing Iams cat food to reach 70 countries worldwide. In the spring of 2014, P&G announced that it would sell Iams, Eukanuba, and Natura to Mars, Incorporated, retaining ownership of the products sold in the European market. Mars Petcare is the world’s largest pet food company. In 2017, it took in over 17 billion dollars in revenue. In addition to Iams, the conglomerate is behind over 40 other pet food brands, including Crave, Whiskas, and Royal Canin. At the end of the 2014, P&G sold Iams’ European division to Spectrum Brands. Spectrum Brands’ pet care division includes One Earth pet food, Furminator, LitterMaid, and Nature’s Miracle. Most Iams pet food is manufactured in the United States. Iams manufacturing facilities are located in Ohio, Nebraska, and North Carolina. The brand’s European division has a plant in Coevorden, a city in the province of Drenthe, Netherlands. Iams explains that their food safety program is one of the strictest in the business, exceeding FDA and USDA standards. The company adds that they receive superior ratings from the American Institute of Baking, an independent certification authority for the human food industry. Iams doesn’t say where their ingredients are sourced. All Mars subsidiaries work with Mars’ Responsible Sourcing program and their Supplier Code of Conduct, both of which mean that the company uses third-party supplier risk assessment to choose ethical, reliable suppliers. Has Iams cat food been recalled? Iams has been recalled several times since its founding in the 1940s. Here’s an overview of the most recent events in the brand’s recall history. In March of 2013, Iams Shakeables dog treats were recalled due to potential mold growth. Later that summer, several varieties of Iams dog food were recalled due to potential salmonella contamination. Iams ProActive Health Smart Puppy dry dog food was recalled due to aflatoxin mold contamination. In June of 2010, Iams ProActive Health canned cat and kitten food was recalled due to low levels of thiamine. The next month, one lot of Feline Renal formula was recalled due to potential salmonella contamination. Like many other brands sourcing ingredients from China that year, Iams issued a recall of several varieties of both cat and dog food due to potential melamine contamination. What kinds of cat food does Iams offer? Iams emphasizes tailored nutrition for cats’ individual needs, saying that their recipes are crafted for cats of specific life stages and activity levels. Their dry cat food selection is limited to the ProActive Health line, while their wet selection is broken down into three lines—Purrfect Delights, Purrfect Delicacies, and Perfect Portions. Chicken and chicken by-product meal appear to be the primary protein sources in this dry cat food. This is a low-calorie, high-fiber food marketed for indoor cat guardians. Theoretically, these qualities help control indoor cats’ propensity to become obese and develop hairballs. The recipe features chicken and chicken by-product meal as the first two ingredients. These meat ingredients are followed by a series of grains—corn grits, corn gluten meal, and ground whole grain sorghum feature prominently on the ingredient list. Dried beet pulp and powdered cellulose serve as fiber sources. The food contains fish oil as a source of omega-3 fatty acids. Traces of carrots, spinach, and dried apple pomace also appear on the ingredient list. The food contains caramel color, a dye that may contain 2-MI and 4-MI, process contaminants with potential carcinogenic properties. Overall, this food has moderate protein content, low fat, and high carbohydrate matter. Each cup contains 332 calories. Chicken, Chicken By-Product Meal, Corn Grits, Corn Gluten Meal, Ground Whole Grain Sorghum, Ground Whole Grain Corn, Dried Beet Pulp, Turkey, Powdered Cellulose, Dried Peas, Natural Flavor, Salt, Brewers Dried Yeast, Dried Egg Product, Caramel Color, Sodium Bisulfate, Potassium Chloride, Choline Chloride, Fish Oil (preserved with mixed Tocopherols), Carrots, Dried Apple Pomace, Calcium Carbonate Fructooligosaccharides, Spinach, Tomato, Vitamins (Vitamin E Supplement, Niacin, Ascorbic Acid, Vitamin A Acetate, Calcium Pantothenate, Biotin, Thiamine Mononitrate (source of Vitamin B1), Pyridoxine Hydrochloride (source of Vitamin B6), Vitamin B12 Supplement, Riboflavin Supplement (source of Vitamin B2), Inositol, Vitamin D3 Supplement, Folic Acid), Minerals (Zinc Oxide, Manganese Sulfate, Copper Sulfate, Potassium Iodide), Taurine, L-Carnitine, Silicon Dioxide, Citric Acid, Mixed Tocopherols, Rosemary Extract. This adult maintenance food features chicken and chicken by-product meal as the first two ingredients, followed by several forms of corn. Corn and its derivatives appear as ground whole grain corn, corn grits, and corn gluten meal. One of this food’s positive points is its use of animal fats. It contains both chicken fat and fish oil. Iams says that the food has an optimal ratio of omega-3 to omega-6 fatty acids, promoting healthy skin and a shiny coat. Overall, the food has moderate protein content, low-to-moderate fat, and high carbohydrate content. There are 373 calories in each cup of this cat food. Chicken, Chicken By-Product Meal, Ground Whole Grain Corn, Corn Grits, Corn Gluten Meal, Dried Beet Pulp, Chicken Fat (preserved with mixed Tocopherols), Natural Flavor, Dried Egg Product, Brewers Dried Yeast, Sodium Bisulfate, Potassium Chloride, Fish Oil (preserved with mixed Tocopherols), Calcium Carbonate, Choline Chloride, DL-Methionine, Fructooligosaccharides, Vitamins (Vitamin E Supplement, Niacin, Ascorbic Acid, Vitamin A Acetate, Calcium Pantothenate, Biotin, Thiamine Mononitrate (source of Vitamin B1), Pyridoxine Hydrochloride (source of Vitamin B6), Vitamin B12 Supplement, Riboflavin Supplement (source of Vitamin B2), Inositol, Vitamin D3 Supplement, Folic Acid), Taurine, Minerals (Zinc Oxide, Manganese Sulfate, Copper Sulfate, Potassium Iodide), L-Carnitine, Rosemary Extract. This fishy canned food is made primarily from flaked tuna set in sauce. The sauce is thickened with modified tapioca starch, guar gum, and carrageenan. While they add to the commercial value of the food, these thickeners aren’t nutritionally necessary. Carrageenan might cause inflammation and more. Instead of carnivore-appropriate fat sources, the food contains sunflower oil as a primary fat source. Overall, this fish-based wet food is high in protein with low fat and moderate carbohydrate content. Each 3 oz can contains 85 calories. Fish Broth, Tuna, Modified Tapioca Starch, Sunflower Oil, Natural Flavor, Calcium Sulfate, Tricalcium Phosphate, Guar Gum, Taurine, Minerals (Iron Glycine Complex, Zinc Glycine Complex, Manganese Glycine Complex, Copper Glycine Complex, Sodium Selenite, Potassium Iodide), Choline Chloride, Carrageenan, Vitamins (Vitamin E Supplement, Niacin Supplement, Vitamin A Supplement, Vitamin B12 Supplement, Pyridoxine Hydrochloride (Source of Vitamin B6), Calcium Pantothenate, Riboflavin Supplement (Source of Vitamin B2), Biotin Supplement, Vitamin D3 Supplement, Folic Acid, Menadione Sodium Bisulfite Complex (Source of Vitamin K3)), Thiamine Mononitrate (Source of Vitamin B1), Magnesium Oxide, Sodium Nitrite (To Promote Color Retention). What do customers think of Iams cat food? Iams cat food receives primarily positive customer reviews, though the brand has come under fire at least once in recent memory. Thousands of people boycotted Iams after learning about the treatment of animals in a research facility doing contract work for Iams. In 2002 and 2003, the animal rights organization People for the Ethical Treatment of Animals (PETA) conducted an undercover investigation of the Sinclair Research Center, a contract laboratory for Iams. PETA investigators released video footage from the lab, some of which you can watch on YouTube. After the footage was released, Iams severed their relationship with Sinclair Research. How much does Iams cat food cost? It would cost about $0.30 per day to feed a 10-lb cat one of the Iams dry foods reviewed above. The Iams canned food reviewed above costs roughly $1.62 each day. If you prefer a food packed in a tray, Iams Perfect Portions food is more expensive at about $2.76 per day. Most Iams foods have prices comparable to mid-level brands like Purina Beyond or Rachael Ray Nutrish, with some of their wet foods entering premium price territory. Even their most expensive foods contain low-cost or unnecessary ingredients that you might not find in similarly-priced foods. 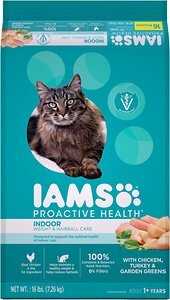 Overall, is Iams a good choice? 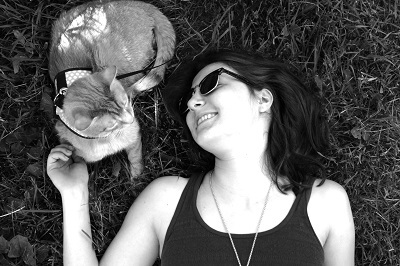 Many cats and their guardians love Iams, but it’s not a brand we’d recommend. Iams has issued at least six recalls since 2004, suggesting flaws in their quality control and safety program. Iams foods are moderately-priced, but have ingredient lists similar to those found in budget products. Where is Iams cat food sold? Iams is widely distributed around the world. It’s available in grocery stores, big box stores, and pet food retailers. Click here to find Iams in a store near you. Online, you can buy Iams on Amazon, PetSmart, Chewy, Walmart, PetFlow, Petco, PetFoodDirect, Target, and Wag.com. 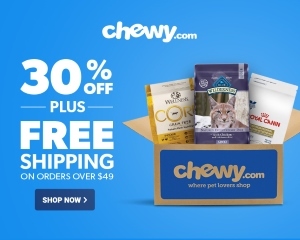 Click here to shop for Iams cat food on Chewy.